The Mantus belongs to the group with roll bars. Others include the Rocna, the Manson Supreme, as well as the roll bar predecessor (though with a flat blade) the Buegel. The other group are those without roll bars: including the Spade and Ultra. Perhaps the biggest difference between the Mantus and all the other roll bar scoop type anchors is that it can be disassembled into three parts for easier storage. This is a very interesting attribute for a cruising boat that we very much appreciate. 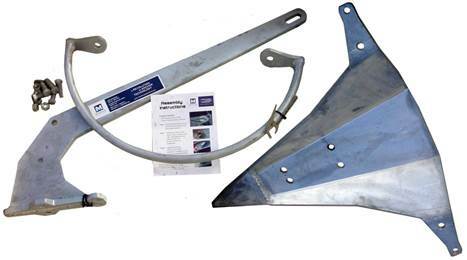 The only other disassemble-able scoop type anchor that we are aware of is the Spade. Another differentiation is that the roll bar is attached to wings that extend out laterally from the anchor blade. This gives the roll bar a wider arc, presumably to increase its setting ability. The chiselled tip of the blade is also thickened to give it a bit more weight, though the manufacturer has not gone quite as far as the Spade or Ultra with their heavily lead-weighted tips. We tested the Mantus in a variety of bottoms ranging from hard sand to softish mud. Like most of its brethren it set quickly and held very well in all these conditions. Like the other scoop types, the Mantus was hard to break out of the bottom, which we think is very good. Out usual procedure here is to bring in our chain rode until it is vertical and then let the wave action and boat movement loosen the anchor from the bottom. Because it sets well and digs deep, the Mantus may also bring up loads of muck necessitating a windlass and a wash-down hose. The latter being particularly important for muddy bottoms. Unlike the Rocna and any of the non-roll bar scoops we have used over the past several years, the Mantus unfortunately did not fit well on our bow roller/pulpit configuration. This is certainly boat specific, and not a negative attribute for the anchor. The rollbar came up hard against our pulpit and the blade came against our bow. An anchor roller extension like we have seen on many modern yachts with plumb bows would no doubt alleviate this. The one thing we are not entirely comfortable with is perhaps one of its best-selling features: the ability to easily disassemble it. We had a similar issue with the Spade when it first came out. The Spade’s shank is attached to the blade with a single bolt and a locking nut. Locking nuts should only be used once, and sure enough it did not take long for someone to report that their anchor had indeed come apart. Spade reacted and the anchor we have has a longer bolt that has been drilled and pinned, so that the nut cannot come off. The Mantus’ blade is attached to the shank with four sturdy bolts with lock washers. The roll bar also comes off and has one bolt at either end. I am sure that if these are all well tightened at the outset and inspected prior to each usage, that there should be no problems. After all, the bolts securing the wheels to your car normally do not come loose – though I do remember seeing one case… I would be more comfortable if at least a pair of these bolts were extended, drilled and pinned – just in case. This would not impede the anchor’s performance. We did also have a problem when we stored the anchor on deck while at our mooring and underway. The bolt heads scratched our deck. Normally the anchor would be stored disassembled, or on the bow roller, so this is also not a big issue. Overall the Mantus is an anchor that performed well for us. It is an anchor that we would be comfortable using long term as a primary or even as a backup stored disassembled. It is certainly worth considering for anyone upgrading from an older style anchor or from what the boat manufacturer supplied with the boat.